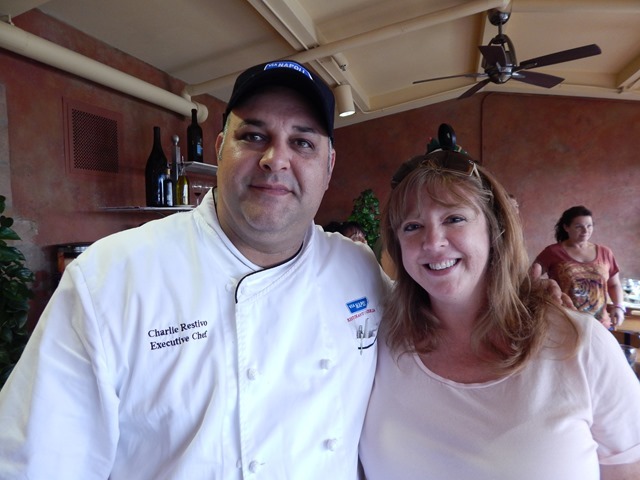 This year I branched out into my culinary adventures at the Epcot Food and Wine Festival and tried a few of the World Showcase Dining Events. I am most definitely a foodie and enjoy eating around the world at the festival. I partake in many of the culinary demonstrations and celebrity guest meals as well as the Party For The Senses and The 3D Dessert Discovery. This year I wanted to branch out further. I love my wine but beer and I are not usually friends. 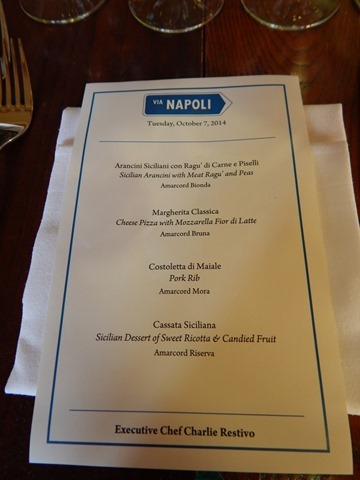 I have a few friends that would rant about the food and beer pairing at Via Napoli on Tuesdays during the festival and I decided to check it out for myself. I will never miss this event again. Let me share with you the amazing experience that was this lunch. 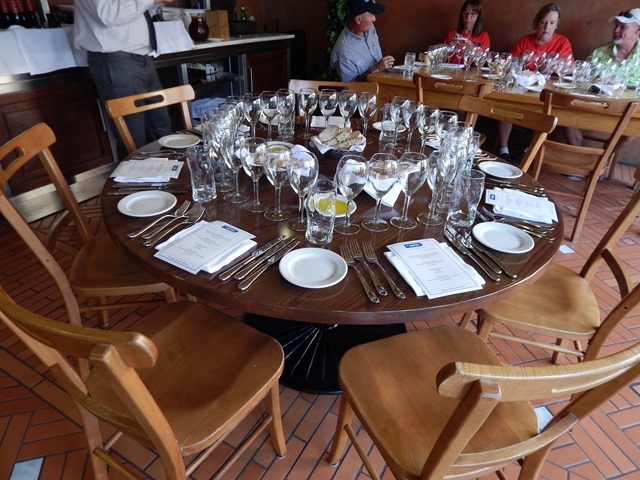 Francesco did a superb job of explaining each course to us and answered any questions guests may have had. 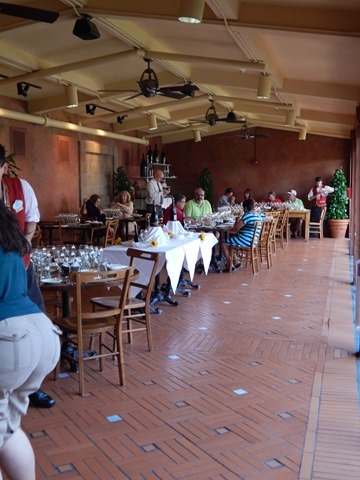 This event takes place every Tuesday of the Epcot International Food and Wine Festival and the menu changes every week! That’s a lot to keep straight and a lot of explaining to do! He did not let us down. 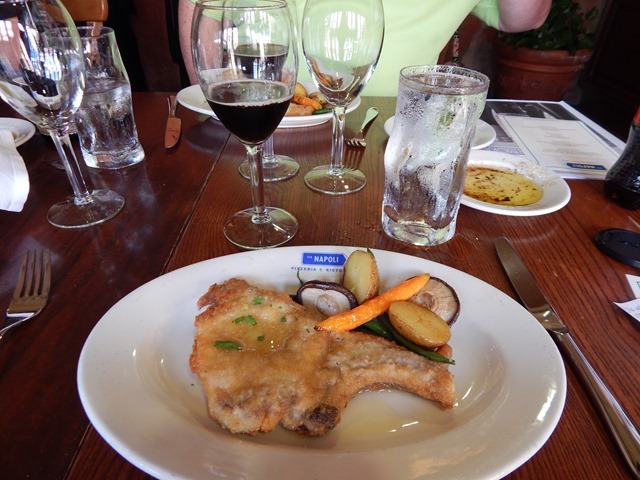 The beer at this pairing was from the brewery Amarcord in Italy. Let me say this… I am not a beer lover. I never have been. I would start drinking beer in North America if it tasted like this. I know I can’t say this about all Italian beer but I can speak for the beer that came from this brewery! The beer sommelier did an amazing job of telling us the history of the brewery and the making of each individual beer. This breweries beer isn’t especially easy to obtain in North America but anyone who sells Brooklyn Brewery Beer can order it in for you… at least, that’s what I was told. 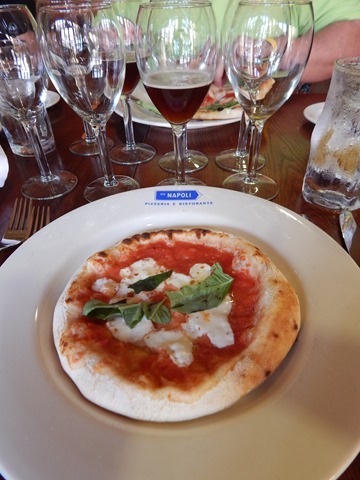 The first pairing started with Amarcord Bionda, a blonde beer which was light and fruity. It was paired with Sicilian Arancini with Meat Ragu and Peas. This dish was mouth watering. It was lightly crusted and risotto filled served with thinly sliced parmesan cheese on tomato ragu sauce. The beer brought out the flavor of the peas in the most subtle and delicious way. The overall course was cheesy, lightly sauced and positively magnificent. 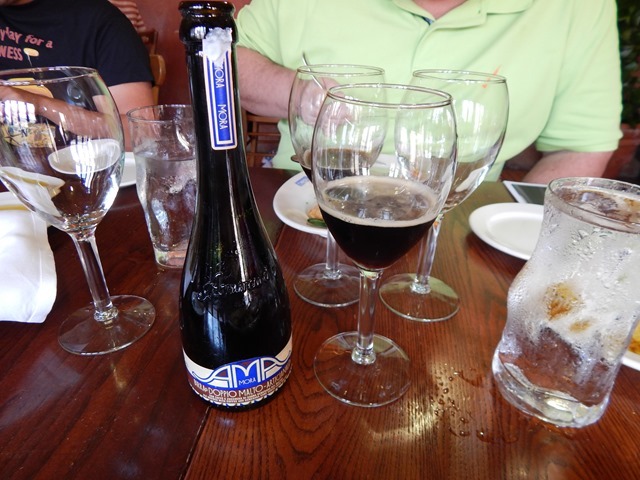 The second pairing started with Amarcord Bruna, a dark beer with more of a malt taste. It was paired with a classic Cheese Pizza with Mozzarella Fior di Latte. I have had pizza in Naples, the birth place of Pizza. This small, perfectly sized pizza took me back to Naples and Solo Pizza (my fave pizza place there). I discovered the reason for this was because Via Napoli imports the water to make the pizza from Pennsylvania because it has the same ph as in Naples. Are you kidding me? That’s going above and beyond… and it’s totally worth it. You could smell the basil. It was quite aromatic. The fresh crust tasted like the wood fire oven it was cooked in and was simply wonderful. The beer paired perfectly with the pizza and was not too heavy at all. 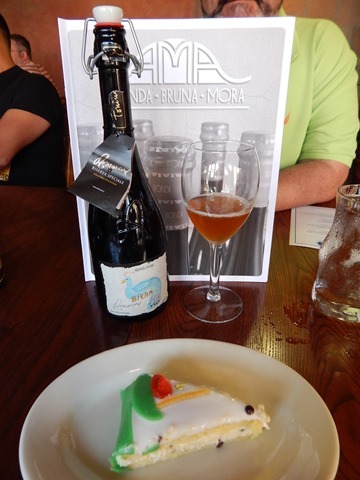 The third course started with Amarcord Mora, another darker beer, that had a coffee aroma and tasted like coffee as well. As a coffee lover, this beer took me by surprise, in the most pleasant way. I loved it! It has 9% alcohol, which is a little stronger than the previous two. It was paired with Pork Rib, carrots and beans. The coffee flavor was perfectly blended with the fried pork goodness which was very tender and lightly coated in breading. Lots of meats are delicious when coated in espresso or coffee and I felt like this beer gave that flavoring to the pork without having to cook it that way. It was fantastic and I may, or may not, have gone back for seconds of this beer. For the final course, we started with Amarcord Riserva, a beer which tasted of sour cherries, sloe berries, orange and honey. It is fermented with champagne yeast and is very fruity in taste. It is dry and bubbly and perfect as a dessert beer. This one is very rare on the USA. 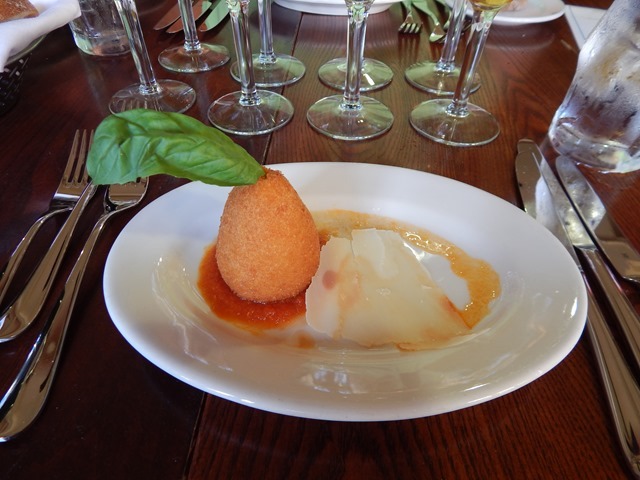 It was paired with a Sicilian Dessert of Sweet Ricotta and Candied Fruit. This dessert had a sweet after taste of almond and chocolate. It was very moist and was a layering of cake and ricotta. I found it to be quite sweet but I love sweet desserts. Some of my table mates felt it was a little too sweet but it’s all in what you like. I liked it very much. I’d like to take a moment to address the bottles of beer. Italians make beer to eat! These bottles are designed to look like wine. They are lovely to look at and are much larger than beer bottles in North America for the most part. Now, to end the meal, one of the servers, Andreas, danced an Italian dance for us and Chef Charlie Restivo came out to greet us all and ask us about our experience. It’s always a nice touch to be greeted by the Chef and I personally enjoy being able to compliment a Chef if the food is as exquisite as it was at this event. 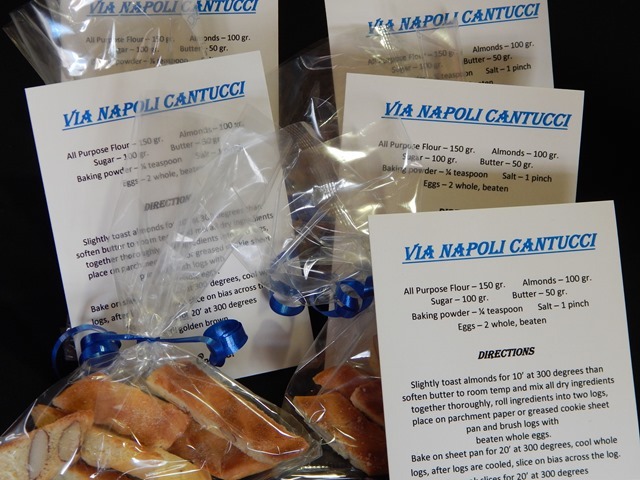 We were given Via Napoli Cantucci Cookies as we were leaving, along with the recipe to make the cookies if we so desired. This dining experience was absolutely incredible and not overly priced in my opinion. I will most definitely be back next year, if they continue to have it. Have any of you been to this event? What were your thoughts?